A record breaking 448 lb swordfish was caught in the Gulf of Mexico on 9/16/06 in Orange Beach, AL. Why are these trophy size swordfish now being caught in the northern Gulf? Due to conservation efforts and bans on longlining, there has been a dramatic increased abundance of large swordfish. Swordfishing has become the hottest trend in recreational fishing on the Gulf of Mexico. On September 16, 2006, The Sea Reaper III, angler Del Sawyer, and crew from Orange Beach, AL caught a 448 lb. swordfish, establishing a new record for the State of Alabama. The previous record of 350 lbs. 12 oz. was caught on 9/15/2005. Why are we now seeing these trophy size swordfish in the Gulf? According to Captain Randy “Goat Roper” Howland of the Sea Reaper III, the fish was caught about 70 miles southwest of Orange Beach (due south of Mobile) and about 50 miles west of the edge of the DeSoto Canyon, the Mississippi-Alabama-West Florida continental shelf. The weigh-in took place at Orange Beach Marina by Harbor Master, Capt. Jim Beason. This year was the third year for the Orange Beach Swordfish Classic, a one day tournament. “Each year the winning fish gets bigger and bigger”, says Capt. Beason. He expects that will continue with the ban on longlining still in place. Bryan Bennett of J&M Tackle in Orange Beach says “Swordfishing used to be an afterthought; now, you not only hope but expect to get a bite.” The equipment used in swordfishing - 50 class rod & reel or better, jumbo squid, Hydro Glow fluorescent green light to attract squid to the boat, and a chemical light stick or battery operated incandescent bulb attached to the line – “was a small part of our business. Sales related to swordfishing have increased a hundred-fold over the last three years”, Bryan says. November 1, 2000, the US implemented a ban on its longline fishing in the DeSoto Canyon area in the Gulf of Mexico. It also implemented a year round ban in an area along the east coast of Florida and has closed an area off Georgia, South Carolina, and a portion of North Carolina (Charleston Bump) to longline gear during February through April. Considering the highly migratory nature of the swordfish, this is good news for the sport fishing industry in Orange Beach. What is longlining? According to the International Big Fish Network (IBFN), longlining involves setting out thousands of baited hooks attached to a single line over miles of ocean. Longlines are a type of commercial fishing gear used to target swordfish and tuna but which also take a large bycatch of undersized fish and non-target species that are discarded dead at sea. Species discarded by longline gear include blue and white marlin, sailfish, sharks, endangered sea turtles, birds, marine mammals, and undersize swordfish. The effect of the longlining ban is a dramatic recovery and increased abundance of swordfish and other species. The swordfish spawns all year long in the relatively warm waters of the Gulf of Mexico, as opposed to seasonal spawning in colder waters. The average life span of the swordfish that are caught in the Gulf is at least nine years (data on life span is very limited). It has now been seven years since the ban on longlining. Do the math – we should continue to see trophy size swordfish caught by sports fishermen out of Orange Beach as long as the ban on longlining is maintained. The future for recreational & tournament swordfishing in the Gulf of Mexico should prove to be very exciting indeed. Don’t forget to report your catch to the National Marine Fisheries Service. The International Commission for the Conservation of Atlantic Tuna (ICCAT) establishes a catch quota for all member nations. According to Ellen Peel, president of The Billfish Foundation, “International allocations are reevaluated based on catch history. No catch history, no catch.” Since the 1990’s, the US has not reached its quota and a representative from the Marine Fisheries is convinced this is, to some degree, due to under-reporting. If the US does not catch its quota of swordfish, its share could be redistributed to another nation. This is why it is important that every non-tournament, recreational swordfish catch - no matter what the size - be reported to the National Marine Fisheries Service info line at 800-894-5528 within 24 hours of the catch. To read the story and see photos of the 448 lb. 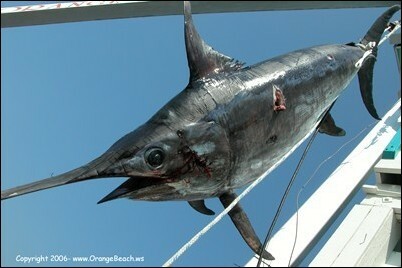 record breaking swordfish, visit http://www.OrangeBeach.ws. Areas of Closure- Image courtesy of the National Coalition for Marine ConservationA map of the souteastern United States showing longlining closure and restrictions in the Gulf of Mexico and Atlantic Ocean. Gulf of Mexico areas mapped in 2000, 2001, and 2002 using high-resolution multibeam echosounders (MBES)Map of Gulf of Mexico showing longlining closures. The years on the map show when the imaging took place.